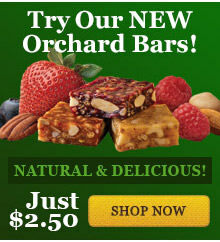 Send a slice of sunshine this season! A treat so sunny it's hard not to smile after each bite! 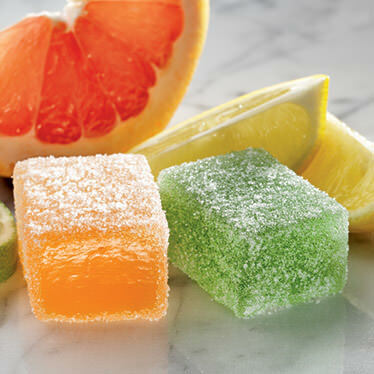 Includes Lemon, Lime, Orange, and Pink Grapefruit flavors. Kosher. INGREDIENTS: sugar, corn syrup, modified corn starch, pectin (pectin, disodium diphosphate, sodium polyphosphate, dextrose, dicalcium phosphate), natural and artificial flavors, sodium citrate, citric acid, malic acid, yellow 5, yellow 6, blue 1, red 40, soy lecithin. This assortment is fantastic. 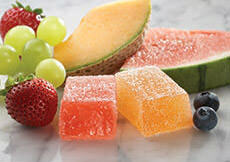 Not only are the fruit flavors true to life but the candies are in about half bite size so that they can easily be cut in half to serve on a platter. Sweet but not too sweet taste treats are always a huge hit whenever they're put out at an event. I like all of the sparklers and I'm glad that Liberty Orchards keeps coming up with new ones.